My Interview with Chip Gaines!! EEEEEEEEKKKKKKK! You guys, I can’t even tell you how excited I am for today’s post. Like Christmas morning kind of excited but way better. I’ve been anxiously waiting for this day because I finally get to share that I INTERVIEWED CHIP GAINES. Yes, you read that right my friends. Little ol’ me had the opportunity to interview THE Chip Gaines and get his renovation expertise on a few projects we have in the works. I sent him a couple pictures of our home and he shared his advice on what we should do to each space. How stinkin’ crazy is that?! As a true Fixer Upper fangirl, I still can’t believe it. I mean, I’ve watched every single episode and I’ve always wished I could get their insight and guidance on how to renovate our home. So to have this chance now is beyond surreal. 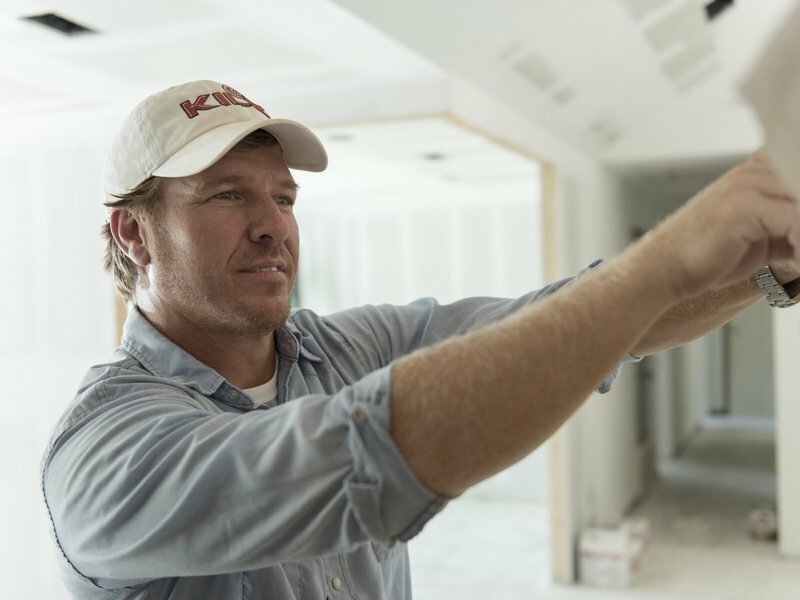 As you guys know, Chip Gaines and KILZ partnered up last year to help spread the word about the importance of primer—and more importantly, having a strong vision when bringing your dream home to life. So when KILZ reached out to me with this opportunity I was incredibly honored. And you better believe I did a pretty epic happy dance. It me took a while to come up with my remodeling questions for Chip, because holy smokes I HAVE SO MANY, but I finally narrowed it down to three and I’m excited to share his answers with you guys today! When I was thinking of what kind of renovation advice we needed for our home, I tried to focus on little projects that have been continuously bumped down on my to-do list. You know, things I want to move forward with but I’m just not sure how to do it. Our most recent big project was the kitchen makeover last year, so with that finished I want to turn my attention to smaller things that I’ve been putting off. This year I want to focus on adding more character to our home, so two of my questions relate to doing that in our living room and basement. Then my third question is all about Chip’s advice on how to freshen up outdated doors and trim. Ok, enough chatting. Let’s get to it! 1) I’ve been wanting to add more storage space and character to this wall in our living room for a while now. What would you suggest we do to give this space more character, but still give us lots of storage? 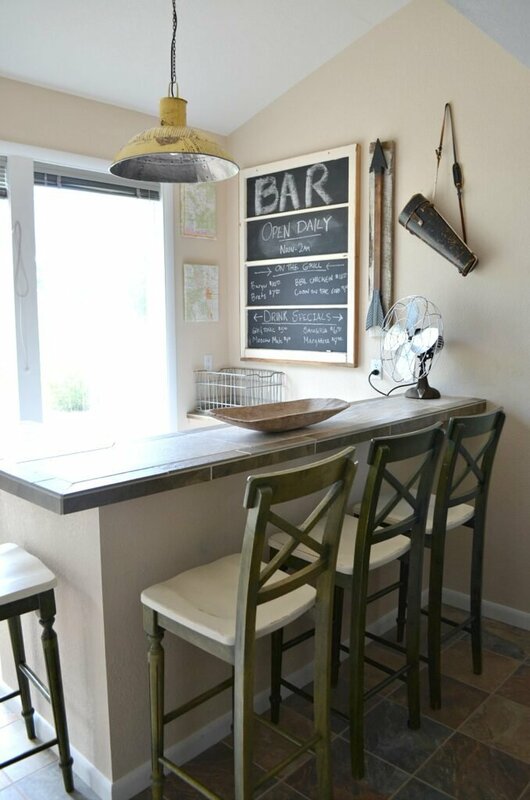 2) The bar area in our basement has an outdated look and I’d love to spruce it up a bit. How would you suggest we update this area to give it a fresh new look? 3) We’d like to update all of the outdated oak trim and doors in our kids’ bedroom. What technique and products do you recommend for that process? Before you do anything, make sure you tape off that wall—unless you’re planning to paint the walls after the trim. Then you’ll want to start with a coat of good primer, like KILZ Max. After that, you should be ready for one or two coats of paint. I typically use a 2.5” angled sash brush when painting trim, but no matter what, make sure your brush strokes all go in the same direction for a smooth and even finish. 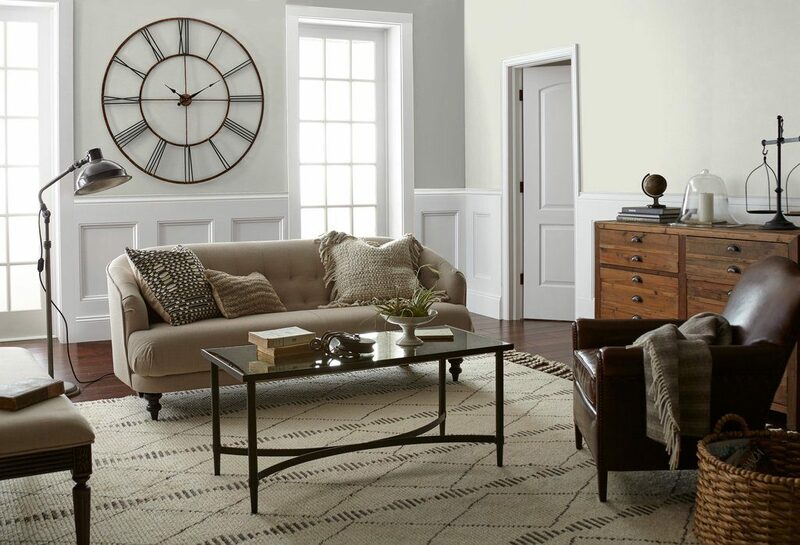 I’d recommend “Shiplap” or “True White” from the Magnolia Home Paint line for the trim and door color. This line of paint works great for high-traffic areas, so the finished look will last through just about anything you throw at it. Well I hope you enjoyed this little interview with Chip Gaines as much as I did! I gotta say, it’s pretty surreal to know that he took time out of his super busy schedule to look at photos of our fixer upper and give me his renovation advice. I would love to ask him 8,562 more questions, but I’m SO grateful to have his opinion and expertise on these areas in our home. Thank you KILZ for this incredible opportunity!! I honestly can’t wait to get to work on these projects. Painting the outdated doors and trim upstairs has been on my to-do list forever now, so I really need to get to it already. I love all the great tips and advice Chip gave for that project, so I think it’s time to get to work! Wow!!! What an amazing opportunity Sarah! I loved his advice and can’t wait to see what you do to implement his suggestions. How fun for you Sarah! Very exciting….we will all be missing Fixer Upper in the coming months I think….happy for Chip and Joanna and their family, but sad for fans. Ii used a paint called Applesauce Cake in my pantry/laundry (I think Olympic paint, or SW) I love it. I actually pick fabrics for my rooms first and it’s the main color on my window toppers in that space with red accents…my hubby even liked it. Paint is an amazing tool in design, affordable but dramatic! Can’t wait to see what you do with these answers from Chip! What was your old wall color in your main rooms called? I love the creamy yellows, had it for my last home for 10 yrs and never tired of it…trying to pick a new one for this house we just built. I took a Psychology of Color class which was very enlightening in my design work. yep, you made me jealous! Seriously, congratulations on the interview! I love Fixer Upper and sad that this is the last season, but family is way more important than a tv show! How exciting for you Sarah! An interview with Chip, awesome! Fixer upper is my favorite and I’m so sad this is the final season too! Like he said paint will make a huge difference in any room! 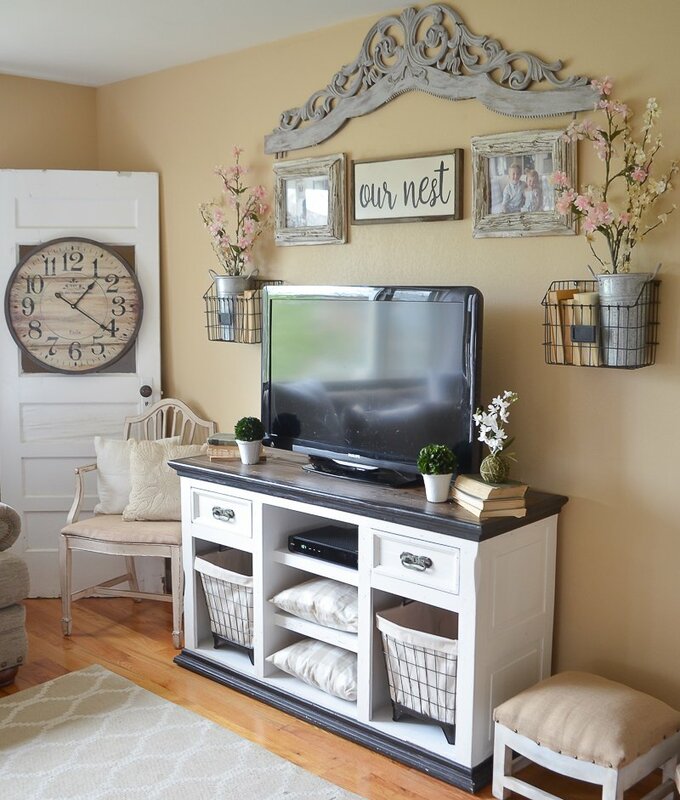 Can’t wait to see all of your home projects! I think if I could only ask 1 question to a pro like himself and Joanna I would ask, ‘How do I focus on just 1 reno at a time?’ I have such a problem with that! Just wanting to redecorate every room all at the same time! 🙂 Thank you for posting! It’s lovely to see how excited you were about this. I’ve never heard of Chip, but now I have to research him. Thanks as always for being so real as a person and sharing your lovely ideas and home with us. Sarah, that is awesome!! How cool!! And about your doors and trim (something I am almost done tackling) it makes such a difference, well worth all the time and work that goes into it! I did one room at a time, to break it up and honestly make it manageable with kids, work, and a dog (couldn’t have all the doorways with wet trim, Hahha!) You got it! Great advice from Chip (funny how he mentioned how just repainting something can change the whole look, haven’t you been saying that so much lately!) so true! How awesome for you Sarah! I like the question about the outdated trim because I have a lot of it. I’m starting on my kitchen makeover and want to paint the crown molding so it’s good to know to start with KILZ Max. Great questions! Thanks! How Cool Sarah! What a fantastic opportunity!